Orcs come in many shapes and forms. Some are deadly from a distance, while others are deadly in close combat. Here you can see our ranks and classes. Lead Elder: The lead elder is in charge of overseeing that everything is on the straight and narrow. Orcish Elder- Old orcs that have spent much time and effort in making the clan great. This is a rank rewarded by other elders. Elders can wear anything they wish and do whatever they wish. Orcish Chieftain - The ingame leader of the Bloodrock Clan. He is recognized by his cape and sash. Orcish Shaman - This is the orc that is closest to the gods. The shaman is the leader of the mages of a specific god. Orcish Lord - The ones that usually make the events we do and helpers of the chieftain. They are also the overall leaders of the squads. They are recognized by their sashes and bone armor. Orcish Mage - These orcs are both feared and respected for thier magical powers. 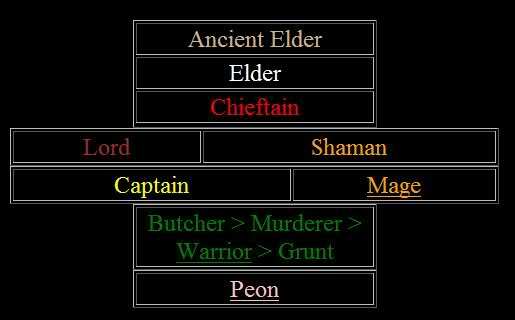 Orcish Fighter Ranks - This is the brute force of the clan. When in battle, they overwhelm the enemy with numbers and strength. They have more fearsome titles as they earn respect and kill more people over time. Orcish Peon- Wimps. They may be strong but they don't know where they are, what they are doing, or even if they will be staying with the clan, thus they deserve no respect. This is the first class that everyone starts at when they join the clan.